This was my first year going to The International. Despite following the game since it was unveiled at the very first International, it took until last week for me to finally make the pilgrimage to Seattle and see the games play out in person. I was quick to meet up with folks who knew more than me, who could sherpa me through the initial shock and awe. Eat outside the arena if you can. Get up and stretch, maybe even walk around a bit between games. Certain rows are better because they offered more legroom. Get your Secret Shop merch order out of the way early. Don’t be afraid to wander. The sense of scale isn’t something you can be ready for at your first International. You think, through watching streams and replays, that you know what it’s like to see an arena roar for a massive play in a video game. You can have an idea, but in the moment when you first hear the roars erupt, it overwhelms you. It was a bit like a college football game: the heckling, the signs, the fanaticism and devotion, and ultimately a love for the game. Everywhere, people were talking Dota 2. It was constantly on attendees’ minds. Who do you have winning in your Compendium? Did you hear about the people who beat Elon Musk’s AI last night? Why the hell do teams keep picking Winter Wyvern? For someone new to the game, it’s a lot to take in. I spoke with a few people whose introduction to Dota 2 was The International—they were dragged in by a group of friends, or just had a passing interest, maybe played another esport like League of Legends or Counter-Strike: Global Offensive. Dota 2 is often called inscrutable, a reasonable assertion. 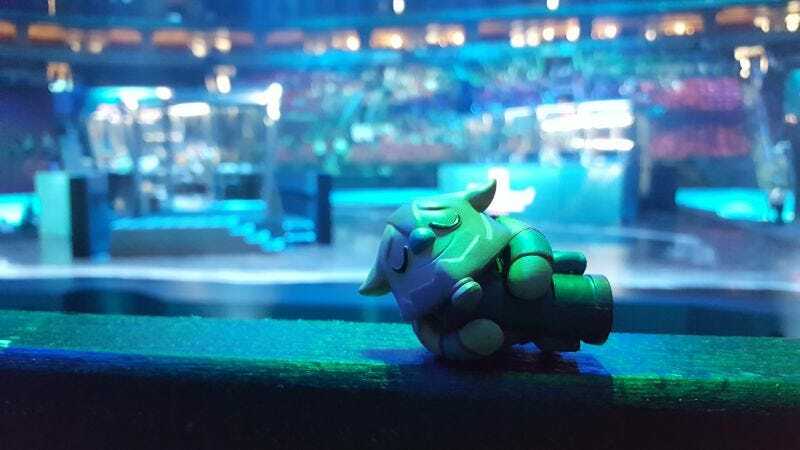 But in the moment, those singular moments of pure Dota bliss in the arena, you didn’t need to know how the game operated to know when to cheer. The spectacle was enough to lead the unversed out of their seats. Reaper’s Scythes rang out like bells, Epicenters made the house bass rumble like Sand King would. But away from the games, everyone was part of the same community. I talked with one fan about Nyx Assassin, and whether the bug would get more play as the tournament went on. A couple was there on a pseudo-honeymoon, a pit-stop on their way to Japan. Seattle natives joked about potential roster shuffles with me, and two Chinese fans who sat behind me with their nation’s flag one day could not have been more affable. I ventured out and away from the arena when I could, sometimes to talk to new people or Twitter friends, sometimes to get some food or fresh air. Red Bull had a LAN center nearby, where you could have a drink and play games. Most of the machines were dedicated to Dota 2, naturally, but a few PlayerUnknown’s Battlegrounds matches were running, and nearby, smaller setups housed Street Fighter V and Super Smash Bros. Melee. In the corner there were stand-up arcade cabinets, where I renewed my long-lost love of Soul Calibur II, and throughout the spacious center, couches sat in front of screens and projectors, streaming the arena matches in real time. Dota 2 was inescapable within the confines of Seattle. No matter where I went, I could spy someone with the signature logo, the red square depicting two bases and a river between them. Local retailers asked us what the prize pool was at this year, and my morning Lyft drivers boasted impressive Dota 2 knowledge even without playing the game. One Russian driver loved Virtus.Pro for representing his nation with aggressive Dota play on the main stage. On Sunday, we went to a local hot-pot restaurant. The owner informed us they were out of lamb—the Dota tournament typically exhausted most of their stock every year. In something like the way that South By Southwest dominates Austin, Dota 2 dominates Seattle for one week every year. Being there, in the arena, there was an overall sense of excitement. Each new game would bring about some new plot line, some new development. Maybe a team goes to a niche pick, maybe the underdog comes out victorious, maybe one team will be the one to surge up through the loser’s bracket to take the whole event. There’s an element of nationalism in the same way it exists at the World Cup, but to the extent that it created a story of the indomitable Chinese teams and the Western hope of Liquid. Fans of both nations respected each other’s players, whether Kuroky or Sccc. On the last day, during the last match of the grand finals, I received a Crimson Witness drop. These are special treasures that only get dropped for the first blood of every game for a select few in the arena, sent directly to your Steam account to redeem in Dota 2. I pulled a Spectre cosmetic, whose market value was estimated at just over $200 when I checked it just now. I don’t think I’ll be selling it, though. It’s a memento. Not that I play Spectre often enough to care, or even care about looking like $200 and change when I play the occasional match as the mercurial ghost. 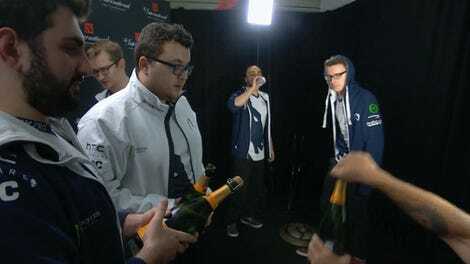 It’s a reminder of that sensation when the crowd roared for a win, seeing fireworks light up Key Arena when Team Liquid closed out their sweep of the finals, the cadence of Dota 2 played out on the grandest scale. What you see in the arena is what you see at home. Nothing fundamentally changes except your view of it. And for the uninitiated, watching at home by yourself on a Twitch stream, it can get confusing, even baffling, to wonder why anyone would make an international trip to see it all. But you don’t go to a football game to get a better view of the game. The same applies to The International—the appeal is not to gain a better view of the action, but to be a part of it. To experience the atmosphere, the arena, to be one voice in the roaring chorus of the crowd. Pedigree didn’t matter inside Key Arena. Low matchmaking rating or high, experience wasn’t required for entrance. One of the greatest revelations that The International provides is that esports, as an in-person spectator experience, isn’t just about the minutiae of strategy and stats. It’s an international gathering of the faithful, those who love to play and the people with whom they do it; it’s a spectacle, a loud and bright one.